I absolutely LOVE The Sims. LOVE. I spent many an hour of my youth playing The Sims and I was so obsessed with it at one point that my sister-in-law made a Sims birthday cake. To me, the best part about this wondrous game was the 'create sims' feature. I loved playing around with different hairstyles, and facial features and oh, don't get me started on the clothing. I've watched Joe creating his characters on Episode and to me, it looks exactly the same as The Sims. Anyone else love The Sims as much as I do? No, okay. 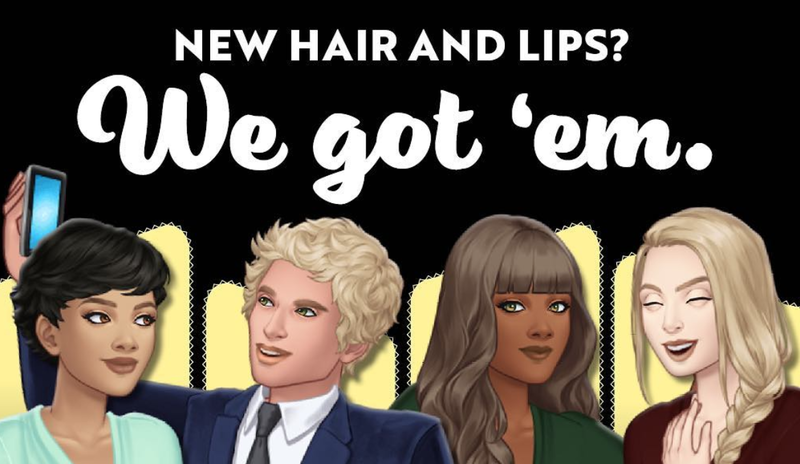 Well if you love the create your character section then I'm about to blow your lickle socks off cos the Episode creators (Cass and Liz) have just announced that there are now new hairstyles and new lips available! WOO! What do we think of the new features? Yay or nay? Now, I would make for a terrible story writer and as for the coding, I've got no chance but if there was a way for me just to play around creating people I would be in my element. Though saying that, if this is actually an option, lie and say it isn't because if it is you may as well kiss goodbye to this site as that would be the last you would see/hear of me. Episode Life: NEW CHARACTER CUSTOMISATIONS!